I’ve been kind of obsessed with bluebird kitchen. the first day i went there i got the veggie sandwich (which was amaze) and a side of the corn salad. i was just so amazed by this salad. i wasn’t sure if i was going to laugh or cry while eating it, it was that good. so good i recreated it at home. and then i laughed and cried into my corn salad because it was so delicious. (i also went back the following day for lunch and got the roast beef sandwich and i may have to go back again tomorrow and every other day the rest of the week to get the roast beef because IT IS THAT GOOD). I made this for Christmas dinner. I just wanted to throw my face in it and eat it all myself. It was that good. There were no leftovers. I was not the one to take the last scoop, unfortunately. Again… Thank you, Martha Stewart for your delish recipe. Preheat oven to 400 degrees. 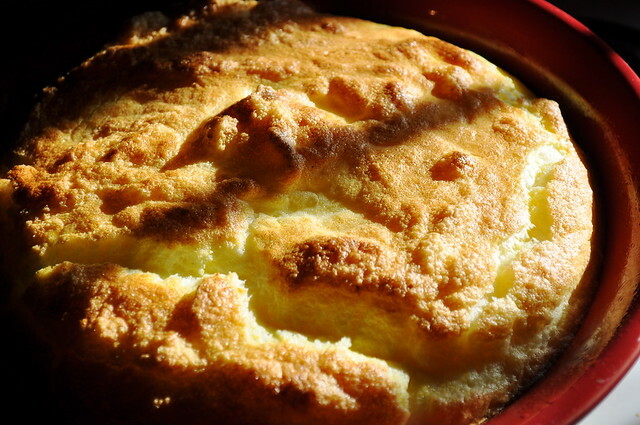 Butter a 2-quart souffle dish or casserole; set aside. In a medium saucepan, combine butter, milk, corn, cornmeal, 1 teaspoon salt, and cayenne. Bring to a boil; reduce heat to medium, and simmer, stirring frequently, until mixture is slightly thickened, 3 to 4 minutes. Remove from heat; stir in cheese. Let cool until just warm to the touch, about 15 minutes. Stir in egg yolks until combined. In a clean mixing bowl, beat egg whites and a pinch of salt until soft peaks form. Stir 1/3 of the whites into cornmeal mixture until combined, then gently fold in the remaining whites with a rubber spatula. Pour into prepared dish. Place dish in oven; reduce oven heat to 375 degrees. Bake until browned on top but still slightly loose in the center, 25 to 30 minutes. Let cool 5 minutes before serving. Look at it. It’s like a pillow of cheese and corn. Who WOULDN’T want to throw their face in it and eat it all?!?!?! It’s getting to be that part of summer where my face starts to sweat. Hot. Hot. Hot. So why not make a chilled soup on a HOT day? Done and done. Thank you, Martha Stewart, for your recipe. 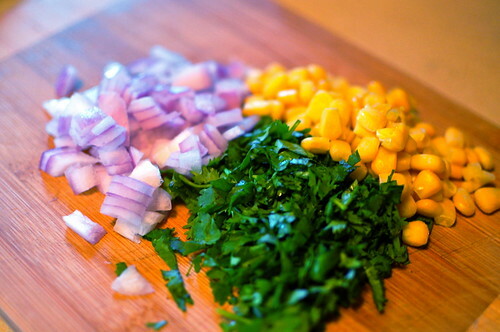 Bring chile, corn kernels, coconut milk, and water to a boil in a medium saucepan. Reduce heat, and simmer until corn is tender, about 20 minutes. Filling a blender halfway and covering with a kitchen towel, puree soup in batches. Strain through a coarse sieve into a large bowl; discard solids. Season with salt and pepper. Chill soup at least 3 hours or up to overnight. Stir in lime juice. 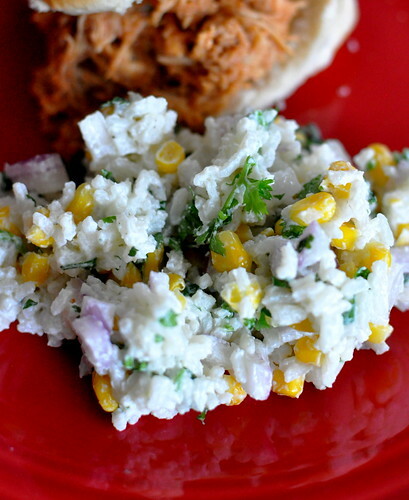 Garnish each serving with fresh corn kernels if desired, and season with pepper. The worst thing about this soup was blending it. 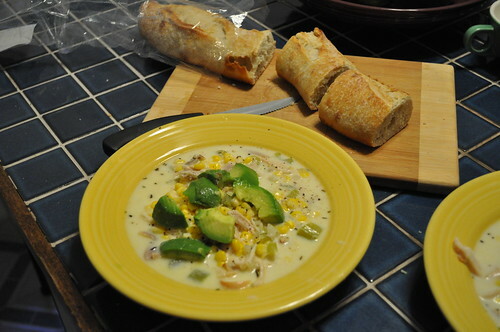 I’ve never made a soup where I had to blend it… and it was a huge mess. HUGE mess. Still tasty, though! I would make this again. Just use an immersion blender… probably. another chowder, another night with ian. tim joined us for this one. and it was simple, simple, simple! i have to give a big shout out to giant eagle and their 4.99 rotisserie chicken. it might be my favorite thing to buy there because it’s cheap, delicious and i can use it in so many things, like this dish. melt the butter in a large pot over medium heat. add the onion and celery and cook for about 3 minutes, or until vegetables are tender. Add the flour and cook for 1 minute, stirring constantly. 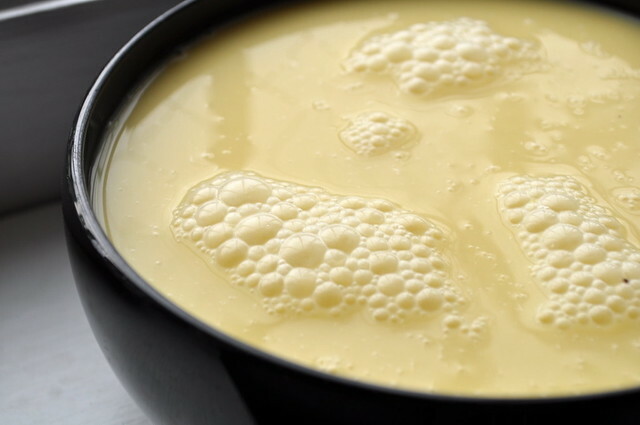 Stir in the milk and remaining ingredients, simmer until thickened, about 5 minutes. Serve with avocado and freshly ground pepper if desired. i think it took about 15-20 minutes to pull together. had a nice sweet taste to it, courtesy of the corn, and it was warm and filling. it makes a lot! so feed your friends or prepare to have leftovers. yum! 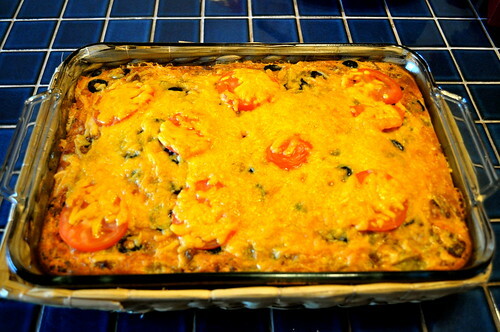 my mother makes this amazing casserole called “taco pie”. now the name of it seems a little deceiving because there’s really nothing taco-y about it. nor is it a pie. regardless, it’s yummy. i even requested it for my birthday dinner, so you know it has to be good! Heat oven to 400 degrees. Grease pie plate. Cook and stir ground meat until brown. drain. Stir in seasoning mix. Spread into plate, top with chilies. 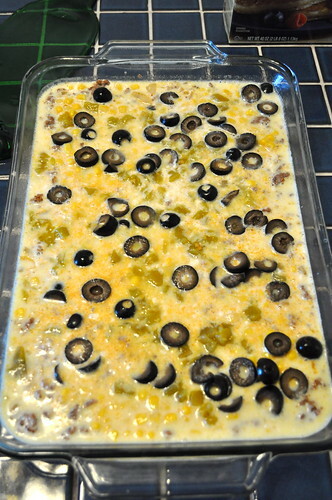 Beat milk, baking mix and eggs until smooth; add corn and olives. Pour into plate. Bake 40-45 minutes or until a knife inserted comes clean. Take out of oven; top with sliced tomatoes and cheese. Bake for 8 – 10 minutes longer. Cool before serving. Serve with sour cream, hot sauce, chopped tomatoes, shredded lettuce and shredded cheese if desired. taco pie is best when doubled. more fiesta to eat! It’s been a while since I’ve made a Martha recipe. When we went to see Martha back in May, they passed around samples of some of her recipes. 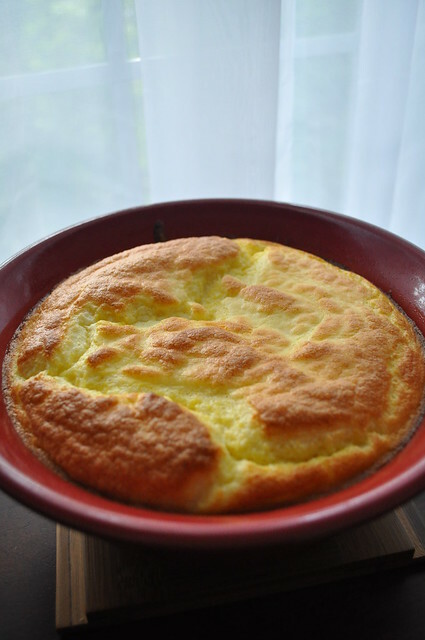 We tried the cornbread and I have been wanting to make it ever since. There were a few cornbread recipes and this one seemed to be the one I thought they passed around. I was WRONG but it was still deeeelicious. You definitely need a spoon to serve this bad boy up. While this may not have been the cornbread I was hunting for in the cookbook, this is still pretty darn good. Not a dry crumbly cornbread and definitely worth trying if you want a different variation. Yum and yum! it gets pretty hot and sultry in western PA during the summertime. and i get a lil’ cranky when i’m in a hot kitchen. so i found a way around a hot kitchen – cookless meals! i don’t remember when i started stuffing tomatoes, i just remember it being a loooong time ago. i was rooting through the kitchen when i was younger and all i found was a tomato, tuna and mayo. i figured lets skip the bread and put the tuna in a tomato. that was the beginning of my stuffed tomatoes craze and it has yet to die. over the years i have improved on the stuffing but sometimes going back to the ol’ tuna and mayo is really the way to go. cut the top off of the tomato and clean out the inside. drain the juices and chop up the insides into bite size pieces. 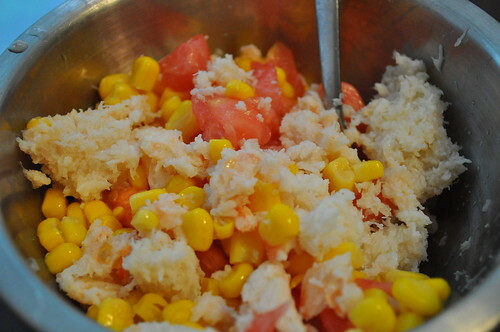 toss the tomato parts, crab meat and corn into a bowl with the mayo. add salt and pepper. cut up the avocado into cubes. stuff the mixture into the tomato, layer with avocado, more mixture until the tomato is full and top with avocado. enjoy! what a delicious treat a stuffed tomato is! at least for me. now don’t just stop at a tomato! i took a trip to visit my sister in Cusco, Peru in 2005 with one of our friends, Chris. we frequented trotamundos cafe and there they had a stuffed avocado. 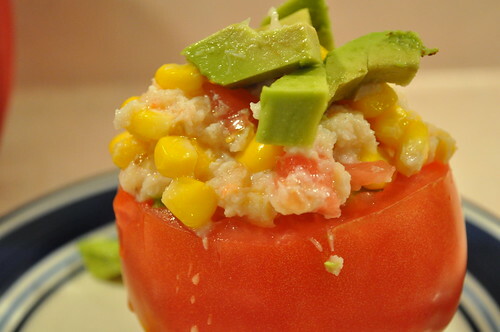 i always think of the stuffed avocado while i eat a stuffed tomato. maybe i’ll make one soon!